We're closing a chapter in the research of Sears kit homes, which were sold from 1908 to 1942. The original owners of the homes are gone now. It's 2017, and most of the children who were raised in the homes and remember them being built are gone as well. Soon we will lose all firsthand accounts of where the Sears houses are located. So it's unusual for me to get a report from someone who remembers a Sears Honor-Bilt house being purchased and constructed. 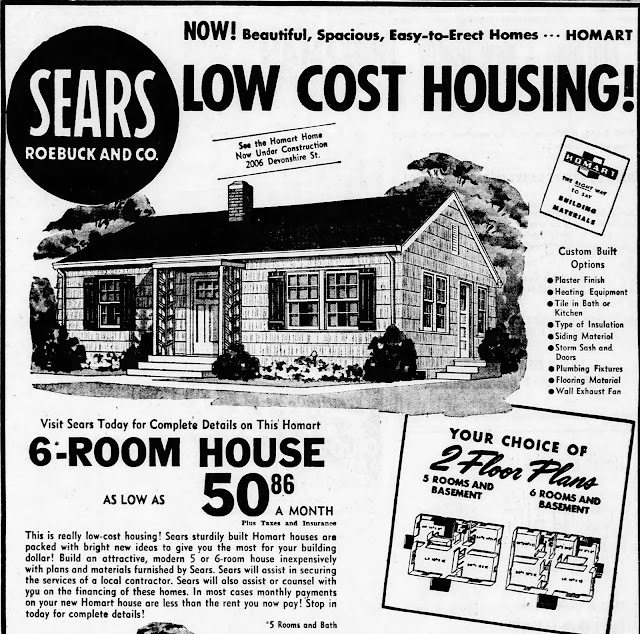 Luckily, there have been a handful of houses I have discovered this way--a Sears Cape Cod in Arlington Heights, a Sears Skywater in Crystal Lake, a Sears Stanford in Painesville, Ohio. However, I often hear from people who said they were raised in a Sears house built in the 1950's. How is that possible? After WWII, Sears sold a line of homes called Homart Homes. Unlike the Sears pre-cut kit houses of the past, Homart Homes were mostly prefabricated. They consisted of factory-built wall panels with windows and doors already installed. Roof gables, front door canopies, roof panels, and basement stairs were also pre-assembled at the factory. Edward and Lorraine Fik bought a Homart Home in 1951 and built it in Oakbrook Terrace. Today, that house was preserved and is the home of the Oakbrook Terrace Historical Society. 17W245 16th St. Oakbrook Terrace. Photo courtesy of the Oakbrook Terrace Historical Society. 1950 ad showing the Fiks' model. They had the six-room floor plan. The materials for the Homart Home were delivered by truck to the Fiks' site in 1951. Edward built the house. Photo courtesy of the Oakbrook Terrace Historical Society. That's going to be quite a job. Photo courtesy of the Oakbrook Terrace Historical Society. Thank goodness for pre-built walls! Photo courtesy of the Oakbrook Terrace Historical Society. The house is almost done. Notice the cedar siding and the trellised porch. Those features are gone today, but the Historical Society hopes to restore them. Photo courtesy of the Oakbrook Terrace Historical Society. Marked lumber inside the house, indicating how the structure was to be put together. Photo courtesy of the Oakbrook Terrace Historical Society. Edward was a chemical engineer by trade. Lorraine worked as the city clerk for many years. Today there is a happy ending for the Fiks' authenticated Homart Home. It will continue to be maintained and appreciated. Photo courtesy of the Oakbrook Terrace Historical Society. Thank you to Bob Shanahan of the Oakbrook Terrace Historical Society for providing information on the house and all the historic photos. I'm pretty sure the house we are getting ready to move into is a Sears house. It was my grandfather's home. I passed away 2 years ago. He was 95 years old.